You may have noticed that animation is pretty popular on the web. There’s no shortage of tutorials, case studies, and libraries targeting motion lovers. It’s a facet of development that can intrigue, enhance, delight, motivate, and impress users. 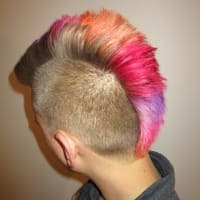 How well is this project maintained? Is it easy for a team to pick up? These details help a business and team arrive at an educated decision that, hopefully, meets everyone’s needs. What makes an animation library? An animation library is a toolset that creates an animation, and explicitly allows for custom support and creation. These libraries must also provide methods to animate objects, tooling to allow the control of an object(s) motion, and directional control for starters. It can also come in flavors that cater to specific abilities such as reactive animations. Since my grading scale towards each library is subjective, your opinion may differ from mine. If a library works for you, your project, and your business goals, that is what really matters. Lets get started. ThrowProps — Smoothly glide any property to a stop using physics. Bezier — Animate properties along a beziér curve. Add-ons like Draggable and SplitText are available as well to compliment the multitude of plugins at your disposal. Here’s the entire list of GreenSock’s product line for further investigation. Overall, the GreenSock community is quite active. There are a plethora of demos, articles, and tutorials available and the community is active in Slack workspaces such as Animation At Work, Stack Overflow, members forum, and Twitter. Documentation is well written, and the syntax is easily digestible and expressive. 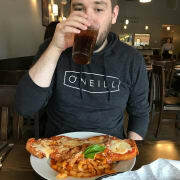 Some portions of GSAP as mentioned are open source while plugins and utilities will be at a cost. 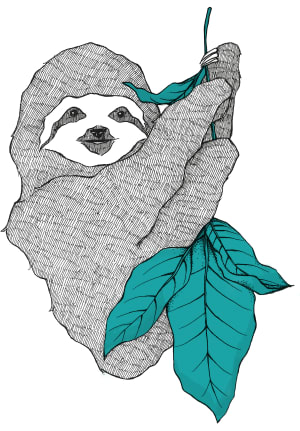 If you do motion work and desire a library that covers many different needs, provides solid community support, provides well-written documentation with an easy to read syntax, and always stays up-to-date; GreenSock is a great choice all around. 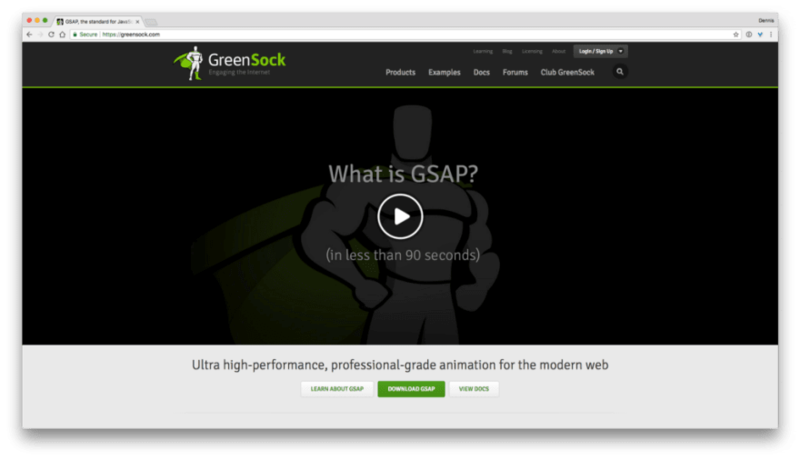 Building for dynamic situations with GSAP can certainly be accomplished using a ticker or ModifiersPlugin should you need that type of capability in your project. https://codepen.io/osublake/pen/65cdc21ce5c49da45709ff9d09d0a754 — LERP frame independent. Its syntax will be familiar including the approach on chaining that’s used in many animation libraries today. Timelines are also easy to instantiate, and controlling properties using an object literal approach is another familiar cowpath. With a public release date of June 27, 2016, it’s a project that’s certainly in its infancy. However, Anime is under active development according to GitHub pull requests (a good thing). For community support, I suggest using the project’s issue tracker before heading into Stack Overflow for the best chance at quick support. When it comes to documentation, be prepared to read code. Anime’s documentation makes comprehension challenging as it lacks explanations to compliment demos. I also found event control lacking the kind of sophistication your normally see with other libraries. Browser support is very good with IE10–11 and Edge included as benchmark tests. However, nothing is noted for iOS or Android. There’s a stress test that’s also available and built to showcase performance. If you need a library that is small in file size, works great with simple timeline sequences, works with SVG (stroke, morphing, transforms etc. 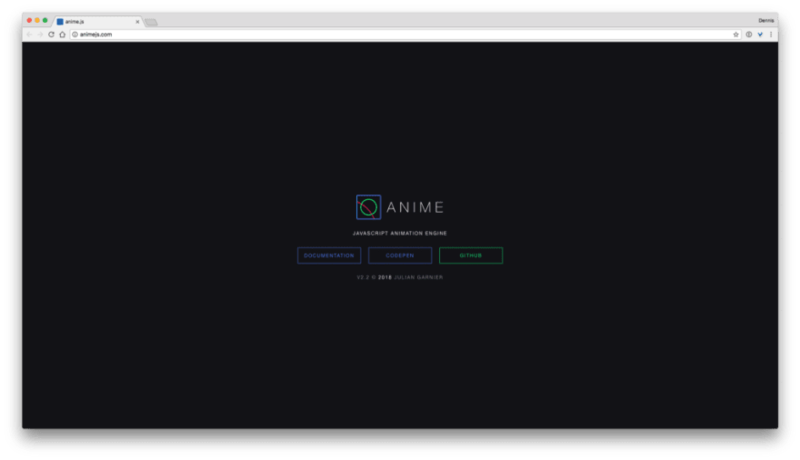 ), is 100% open source, and has a familiar syntax, then Anime is for you. 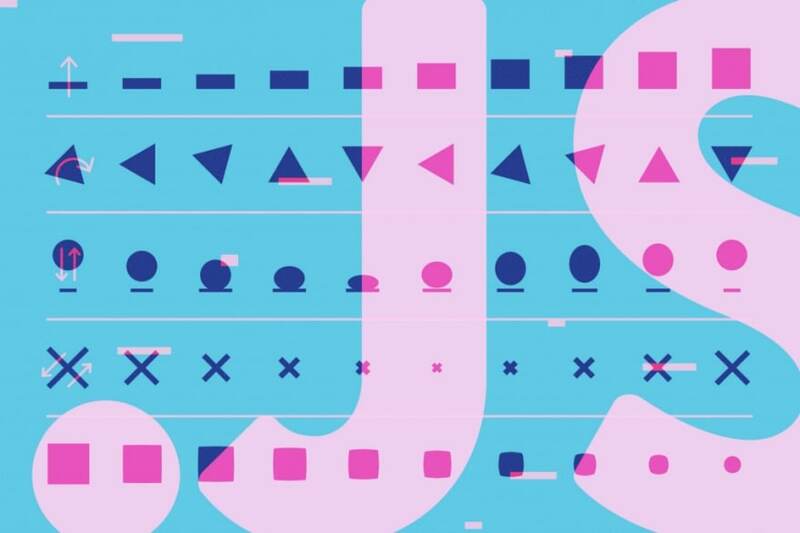 Mo.js is is an open source project that can be installed via npm or CDNJS. It claims to be fast, reliable, unit tested, modular, robust, and has a simple API; all to help diminish large file sizes overheads. Upon examination of the GitHub repo this project doesn’t contain many contributors, and updates have not been issued in any recent time. The project’s most recent commits range between mid-2016 and mid-2017, but hasn’t seen much action since. I’ve been told by reliable sources that this library has been stagnant due to the busy life of its creator, so the future of this library is very open-ended. I would suggest steering away from it as support will be bleak, the community is small, and the future direction of the library is uncertain. You should also be comfortable writing in ES6 as all demos, and code examples are written in this fashion. The overall syntax of this library is certainly confusing, and wording for documentation is complex, requiring an deep understanding of the project inside and out. Since you’ll most likely require a strong understanding of how this library is written it could take some time to pick up if you’re in a hurry. Popmotion’s creator is hoping work on Pose will address my primary concerns by providing a declarative, DOM-specific layer that should make animation super-simple. Popmotion certainly has capabilities when it comes to reactive animations based on mouse position, and anything not duration based. A good majority of developers will find the learning curve demanding. In theory it sounds nice, but when you actually start trying to write code, it’s surprisingly cumbersome and requires writing many aspects by hand. 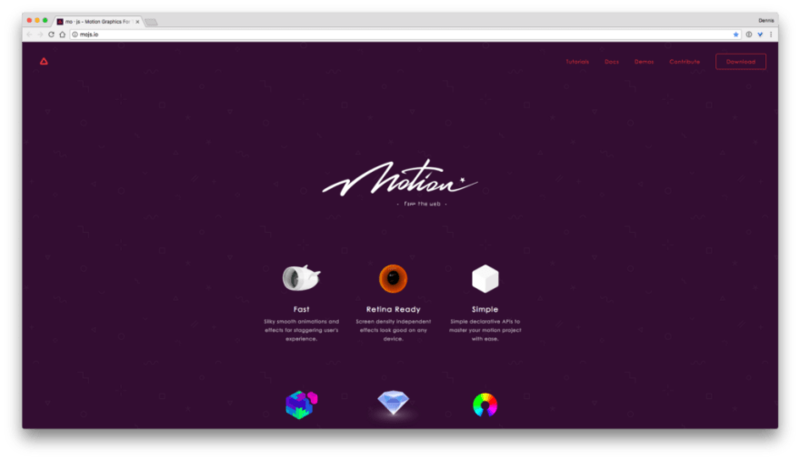 If you want a motion library with reactive in mind, small in size and 100% open source; Popmotion is for you. If you need support, feel free to reach out in the Animation at Work Slack workspace via #popmotion channel as well as GitHub’s issue tracker. 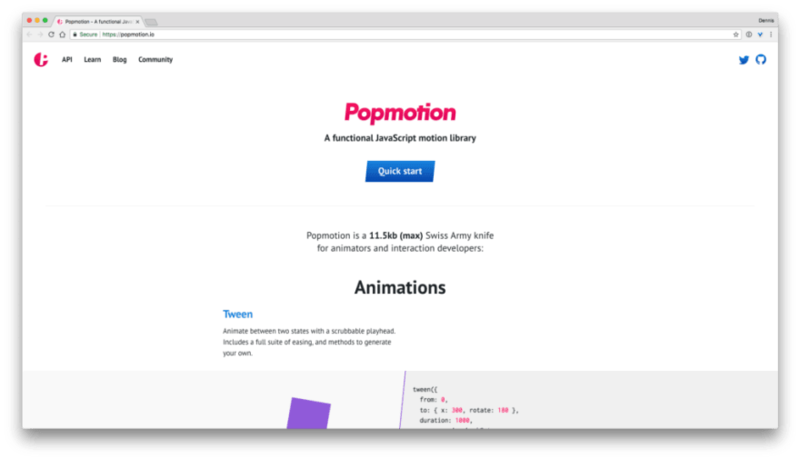 If you want a library with a focus on reactive animations, 100% open source, and willing to do some hard development work up front, then Popmotion is for you. Those familiar with jQuery will feel right at home with Velocity. 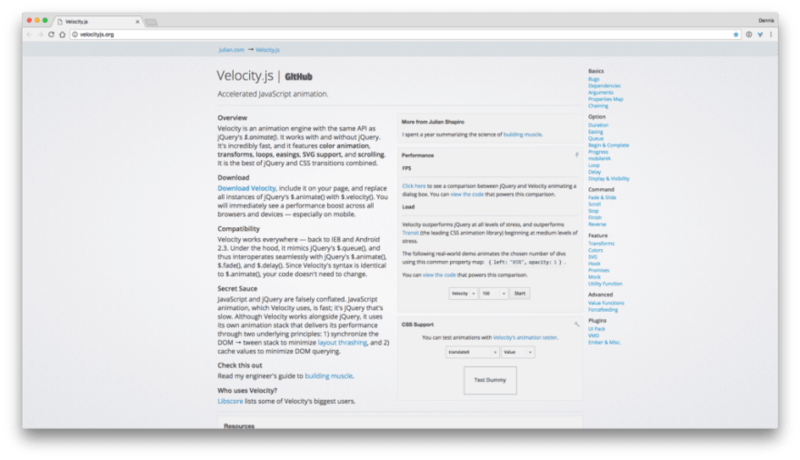 Velocity is an animation engine with the same API as jQuery’s $.animate(). It works with and without jQuery. It features color animation, transforms, loops, easing, SVG support, and scrolling. If you decide to use jQuery with Velocity, it’s just a matter of replacing $.animate() with $.velocity. It works everywhere including support as far back as IE8 and Android 2.3. There are also plenty of easing options to choose from including spring physics. Currently, this project is still under active development according to GitHub commits. It’s a library that has been on the market for quite awhile, widely used, and well-known. Velocity aims at convincing you from the start how performant it truly is through provided performance tests. There are plenty of articles too including videos and tutorials/books should you ever find yourself stuck. If you’re a ScrollMagic user you’ll be happy to hear that it works well with Velocity. SVG support is great too. If you need a library with documentation that reads well, has a friendly syntax, works with & without jQuery, a long track record, abundant resources of teach materials, and decent community support then Velocity is for you. While it’s important to think long-term, it’s just as important to solicit team feedback before making a decision. If you go with a minimalistic library today because it technically does what you need in that particular moment, you might not plan for what happens in 6 months when you need to add something more ambitious. If you’re using a library with little traction or support it can backfire long-term; especially if you run into browser bugs. A long track record helps businesses feel safe, but a well documented, easy to read syntax with strong support and a good track record will keep both sides pleased. Let me hear your thoughts in the comments and happy animating! Special thanks to the Animation At Work Slack community for their time and opinions on this topic. 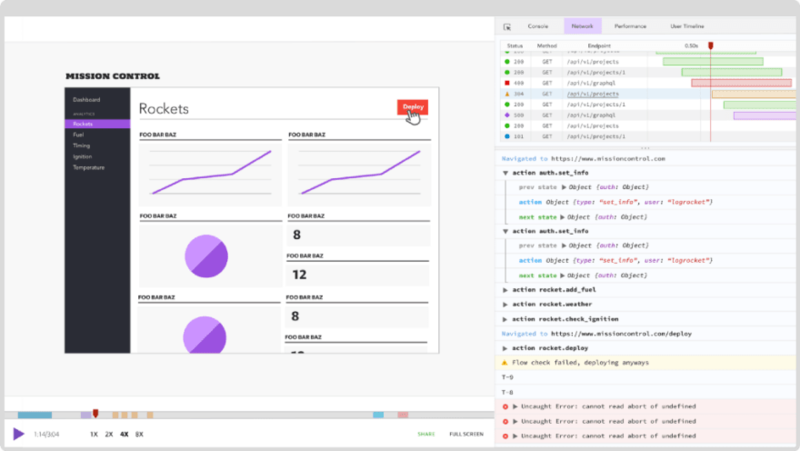 LogRocket is a frontend logging tool that lets you replay problems as if they happened in your own browser. https://github.com/googlearchive/flipjs — A helper library for FLIP animations. https://github.com/davidkpiano/flipping — A tiny library (and collection of adapters) for implementing FLIP transitions easily.